This deck abuses -1/-1 counters for fun and profit: it's a token/stax deck, killing and maiming your opponents' creatures, with many possible combo kills thrown into the mix for good measure. Hapatra's first ability is very relevant, surprisingly. You can take advantage of the fact that most tables will have at least one player without a creature on Turn 3, so you can usually swing to kill small utility creatures and get snakes. My favorite target to murder is Dark Confidant , hehe, but it's also extremely valuable to kill early-game mana dorks in a high-power meta. But her second ability is the reason to build around her. Spells like Black Sun's Zenith give disgusting value here: when you kill the board, you retain an army of deathtouching snakes! The snakes work equally well as attackers or defenders - deathtouch is a powerful ability on expendable creatures. It's also ludicrously easy to get more than 20 snakes, trade them for mana/cards, then win. There are six major infinite combos (detailed below), which can yield many early wins. If the combos fail, for whatever reason, the deck can easily transition to being a pseudo-stax build (with Sadistic Hypnotist , Ulvenwald Tracker , etc) and/or classic beatdown (with Eldrazi Monument , Triumph of the Hordes , Craterhoof Behemoth , etc). -- Devoted Druid + Mikaeus, the Unhallowed gives infinite death triggers and infinite -1/-1 counter placement. With Obelisk Spider or Blood Artist , this causes your opponents to lose infinite life. Paired with Hapatra, Vizier of Poisons or Nest of Scarabs , this creates infinite tokens. Paired with Lightning Greaves , this also creates infinite mana. This is a common pair of creatures to tutor with Defense of the Heart . -- Devoted Druid + Hapatra, Vizier of Poisons + Ivy Lane Denizen generates infinite green mana and infinite snakes. I discovered this combo by accident! Unlike the other combos, Nest of Scarabs does not work as a replacement for Hapatra, Vizier of Poisons here. This is my default combo to fetch with Protean Hulk / Defense of the Heart , as it generates immediate snakes without waiting for summoning sickness to wear off (though the combo only produces infinite if Devoted Druid does not have summoning sickness). -- Mikaeus, the Unhallowed + any creature that ETBs with a -1 counter on it + any free sac outlet (such as Sadistic Hypnotist ) goes infinite without needing your commander. This combo is handy when other combos have been disrupted, or when Hapatra has been somehow neutralized, although it tends to be a backup plan (as it requires 3 non-commander pieces, and a lot of mana). -- Earthcraft + Squirrel Nest (+ a basic land) is a classic combo, and creates an infinite number of squirrels. Be aware that this combo will leave you somewhat vulnerable while pulling it off, as you'll have infinite creatures but no extra defenses! This is a backup combo, as it requires two noncreature cards. However, this combo is feasible even when your commander is prohibitively expensive or stolen, and it does not die to Wrath of God (unlike our other combos, which are at least partly creature-based). Both halves of this combo are good on their own in the deck, however, so it's been a good addition to the list. -- Archfiend of Ifnir + Generous Patron is another combo I discovered by accident! If you control both of these creatures and have 8+ cards as you move to your discard step, you create a pseudo-infinite loop: you discard down to 7, draw more cards due to the counter placement, then the game returns to the discard step (since you still have more than 7 cards). This combo continues until your opponents' creatures are all dead, and you have drawn cards equal to their total power. This is a surprisingly good creature lock: you can kill every creature your opponents control every turn, with no extra investment! Not to mention that, while Hapatra is handy here, she's not necessary for the combo to work. Your best mass distributors for -1 counters are Midnight Banshee , Soul Snuffers , Liliana's Influence , and Black Sun's Zenith . 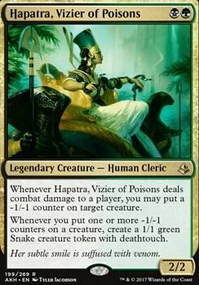 Most of these will put counters on your snakes too, but your snakes will return if you control Hapatra, Vizier of Poisons (or Nest of Scarabs ). Functionally, Midnight Banshee acts like casting Deploy to the Front each turn! Archfiend of Ifnir can fulfill this role as well, although it tends to be cycled away unless it was fetched with Survival of the Fittest . I've frequently netted more than 60 deathtouching snakes by doing this. Just try to ensure Hapatra has a way to survive the global counter placement, such as Ivy Lane Denizen or Defiant Greatmaw (who should really find a home in the deck again). 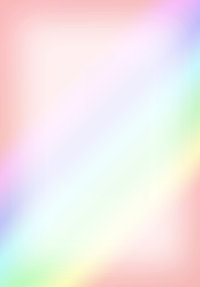 Earthcraft is one of the most integral cards in the deck. It creates what I personally call a "snowball effect", where many spells will generate more mana than they cost (analogous to casting spells while controlling a Paradox Engine ). If you create snakes with some -1 counter placement effect, they can be immediately tapped to untap your lands and continue casting further spells. Generous Patron - hoooooly mother of god, that card is good. She frequently will draw 5+ cards per turn, and nearly always draws 2 cards upon ETBing. She's an extremely good card to tutor for when you simply need to refill your hand. Not to mention the aforementioned "infinite" combo with Archfiend of Ifnir ! Natural Order (and similar effects) frequently grab Craterhoof Behemoth for lethal T5 or earlier. This can be enough to close out a game alone against an unprepared opponent. Meanwhile, Triumph of the Hordes forces your opponents into a sadistic choice: if they block, you get more snakes because the infecting creatures deal combat damage in the form of -1 counters. If they choose not to block, even five snakes can prove deadly. And while proliferate is not a primary focus in this deck, Contagion Clasp can give you those last few poison counters. And of course while Crop Rotation is primarily intended to fetch Gaea's Cradle ... it can also decrease your commander tax ( Command Beacon ), provide graveyard hate ( Scavenger Grounds ), give you land destruction ( Strip Mine ), or find evasion ( Shizo, Death's Storehouse ). Defense of the Heart usually tutors for one of the two-creature combos in the section above: if you control your commander, Devoted Druid and Mikaeus, the Unhallowed / Ivy Lane Denizen are good choices. If you don't control your commander, Archfiend of Ifnir and Generous Patron are a good pair. Natural Order also usually grabs Craterhoof Behemoth (feels like Legacy Elves), but it can also grab your other combo piece directly or just a useful creature at the time. Eldritch Evolution and Chord of Calling usually vary heavily based on board state, but Devoted Druid is almost never a bad choice. Survival of the Fittest deserves its own section. This deck unfortunately has a lower creature count than Survival would desire, but it's still an absolutely vicious card. If you want to play a bit more of a long-game, you can tutor for Meren of Clan Nel Toth to guarantee you have a creature in hand to discard every turn, to continue tutoring with Survival. If you need more snakes, Survival of the Fittest pairs beautifully with Archfiend of Ifnir , letting you generate obscene amounts of snakes without even affecting your own creatures. Finally, you can obviously tutor for whatever combo or aggro creature you need at a given moment in time. Don't forget that you can reanimate the creatures you discard using Reanimate , Atzal, Cave of Eternity , Victimize , etc - tutoring for a Craterhoof Behemoth , discarding it, and reanimating it is an easy trick to murder an unsuspecting opponent. Your non-creature tutors will usually grab Blowfly Infestation for the one-card combo with Hapatra, Vizier of Poisons , of course. Just remember that you need to start with two snakes to execute this combo, although killing your opponents' 1-toughness creatures can do the trick... It's also not unusual to tutor for Earthcraft or Squirrel Nest if you have the other half already. There are some other tutors I used to run, which I'm listing here for posterity. Uncage the Menagerie was cut from the deck, but it's still a budget option. It's heavily dependent on context - if you control Quillspike , X=2 can grab Devoted Druid + Blood Artist . If you control Devoted Druid , X=3 can grab Obelisk Spider + Quillspike + Necroskitter . If you are in the late-game and cannot combo for whatever reason, X=4 grabs Ivy Lane Denizen + Soul Snuffers + Meren of Clan Nel Toth + Vhati il-Dal for a more long-game token approach. If you include Birthing Pod in the deck, it almost always goes for Ulvenwald Tracker first - after all, he does basically read ", : Murder " when paired with a snake token. After that point, it can tutor for several options, but most often hits Devoted Druid . Protean Hulk was in the deck until recently, but when Quillspike was cut, it could only tutor for one combo and thus was no longer worth the focus in the deck. This deck thrives in a "mixed meta" - as in, where at least one player has very few creatures (so you can connect with Hapatra, Vizier of Poisons to get guaranteed snakes) and at least one player has many creatures (so that you have targets to put -1 counters on). These are not insurmountable challenges: if all of your opponents have creatures, you can rely on cards other than Hapatra, Vizier of Poisons to place -1 counters. If none of your opponents have creatures, you can place counters on your own creatures without harming your gameplan TOO much - indeed, your infinite combos rely on doing so. They just tend to slow down the deck's tempo. Or you can use cards such as Forbidden Orchard or Dowsing Dagger Flip to guarantee targets for your -1 counter placement. The deck is geared very much towards multiplayer (simply because more creatures = more -1 counters from global effects like Black Sun's Zenith ). However, if playing in 1v1, the best plan is to prioritize stax cards against a controlling opponent, and early "rattlesnake" blockers against aggro decks. Against a control deck, your combos will usually be disrupted. If you control Mind Slash or Sadistic Hypnotist , you can empty their hand before comboing. If this is not feasible, you can force them to waste their counterspells on your combo pieces, then push for a win through a token-aggro approach. What remaining cards would you add/cut? Now exists as a (slightly untuned) $25 budget deck! Check it out! Like the God-Pharoah, I shall return - Give an upvote if you like the deck! ...to support the Snake Revolution! Sooooooo at the GP, I bought a Gaea's Cradle that has now been added to this deck! I also added Crop Rotation to tutor for it, as well as a couple of smaller changes that I think have tightened up the deck significantly - stay tuned for updates in the primer! I'm excited to make this my next proper project now that my The Locust God deck is more where I want it.